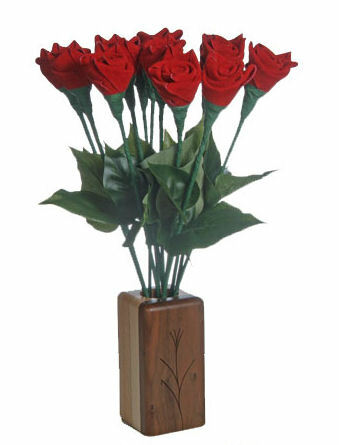 You also can buy single stem roses or a group of them in a wood vase. You don’t have to get just red roses; they come in purple, yellow, red or mixed. If your a biker or Goth type, you might want to try the orange and black leather roses in the picture to your left. These also come in a dozen, half dozen or 2 single long stem roses. Leather also happens to be what you give on your 3rd wedding anniversary. Nothing is more perfect than leather roses on the 3rd wedding anniversary. These quality leather roses are smooth and soft and will last forever. The people who make them also carry many other great types of roses for Valentines day, birthdays and anniversaries. So this year give your better half something unique and different, like a dozen red leather roses. You’ll be able to look at them forever and remember that special day. Or get a single long stem leather rose for a little something extra to go with all the other things you have planned. Check them out today!